The message was sent out to all parents and guardianswith children at McAuley Catholic High School at around 1pm this afternoon. TERROR POLICE are continuing to investigate potentially malicious posts on social media which sparked panic at a Doncaster school yesterday. A report made to South Yorkshire Police regarding posts concerning McAuley Catholic High School, in Cantley, was passed on to counter-terrorism police. 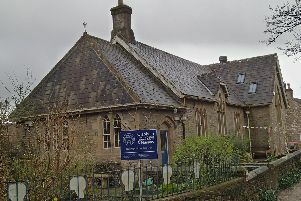 The school in Cantley Lane remained open, but there were police on site throughout the day as the investigation into the origin of the posts began. Pupils and parents were warned not to reply to any unsolicited emails or social media posts. Today police sought to reassure parents, including those who had pulled their children out of classes yesterday. Doncaster Superintendent Neil Thomas said: “You may have noticed an increased police presence at McAuley Catholic High School in Doncaster following concerns raised about malicious posts made on social media. “To reassure the local community, uniformed officers will be carrying out patrols at the school and a team of specially-trained officers are also present and will continue to be there over the coming days. “Our officers are on hand at the school to speak to any pupils, staff or parents who may have concerns. The policing team will also be supported by the school’s Children and Young Person Officer. “I empathise with parents who have concerns – the welfare and safety of their children is an absolute priority for us. There is currently no intelligence to suggest that it’s necessary to keep children off school and we are working with the head teacher to ensure disruption is kept to a minimum. An image of a ‘malicious’ post on Instagram went viral hours before the school contacted parents yesterday. After learning of the incident on social media, Doncaster mother Shanie Varley pulled her 15-year-old daughter Alisha Hesketh out of the school. She criticised the school for not making parents aware of the situation until later. “I found out when Alisha phoned me panicking because she’d seen it on Facebook, but no-one was explaining what was going on,” she said. “The post had been seen and then sent on through Snapchat and then Facebook so all the kids knew but the parents weren’t told. “As soon as I got off the phone with her I contacted the school, who said that police were there and that it was ‘nothing to worry about’.